For a young 2 -year-old German Shepherd named Misty, her short time on earth has been nothing but an uphill struggle. For some unforsaken reason, her owners just didn’t have the time to care for her, nor show her the love and attention she deserved. 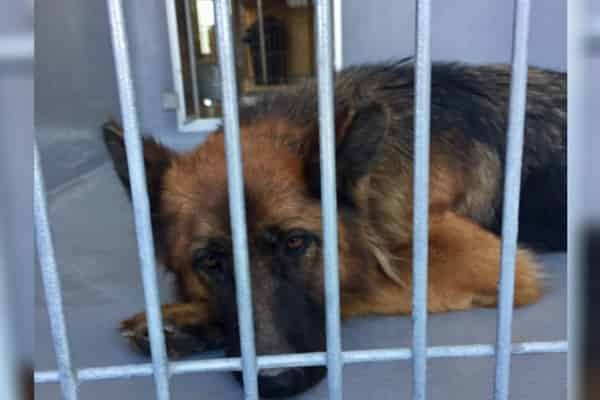 According to shelter staff at the City of Tracy Animal Services, Misty’s family tied her up outside since she was a pup, leaving her all alone to fend off the elements come rain, snow sleet, or hail. The physical toll this has taken on the pup is quite visible as evident by the matted fur, lice, and tick infestation, slowly bringing her down. Speak Up! if you or someone you know is interested in giving Misty the forever family she rightfully deserves, please contact the City of Tracy Animal Services at (209) 831-6364, and reference the shelter ID #A029229. 2 Responses to "Young shepherd tossed in kill shelter like trash, is just too sad to lift her head anymore"
AGAIN ... NOT A PIECE OF INFO. NEEDS DATES NEEDS ANIMAL INFO AND ID # NEEDS SHELTER AND CONTACT INFO.